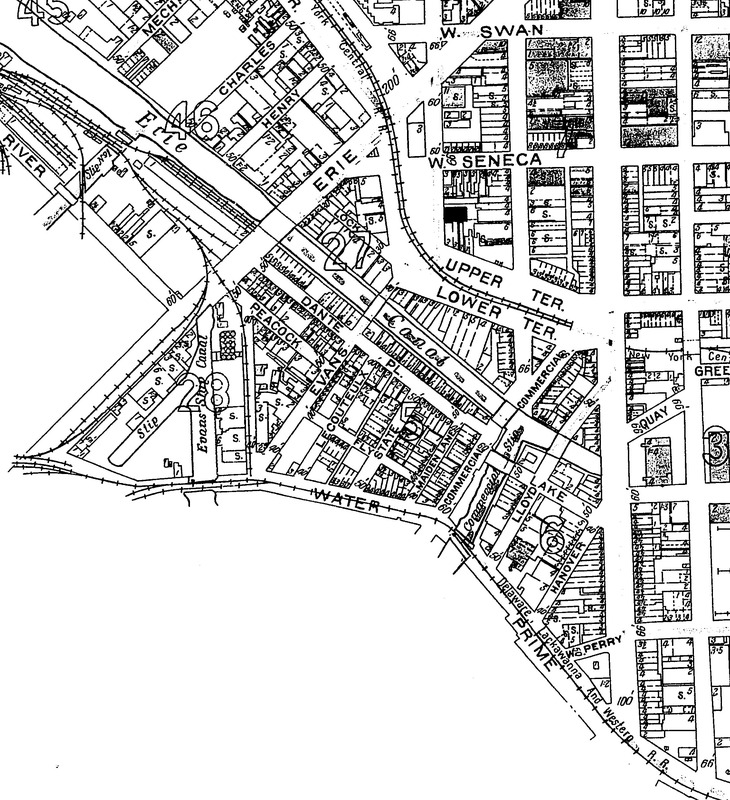 This post is Part Two in a series of three posts about Buffalo’s Canal District. Click here to read Part One, discussing the early days of the Erie Canal, when the area was part of the seedy underbelly of Buffalo. Part Three will come out next week and will discuss the most recent years of Buffalo’s Canal District. Today’s post discusses the Italian Quarter and Dante Place, the street that replaced Canal Street. The Canal District slowly died as trade along the canal was replaced by railroads. Industry and immigration began to change the landscape of the area. The sailors and canal business moved out of the area and sought work elsewhere. The vacant buildings were taken over by immigrants. The Canal District made way to what was called the Italian Quarter, due to the influx of Italian immigrants. Between 1900 and 1920, the Italian population of Buffalo increased from 6,000 to 16,000 (Buffalo’s total population in 1920 was 506,775). The Italian community separated in Buffalo based on the territories and villages of their homeland – each settling into different parts of the City of Buffalo. The Abbruzzese moved to the upper East Side; the Campobassini moved to the Lower East Side; the Calabrians moved to South Buffalo; and the companies moved to an area near Downtown Buffalo. The Italians who settled in the Canal District were coming mainly from Sicily to escape a famine and high taxes. The area was also known as “The Hooks” after the cargo hooks that the dockworkers and longshoremen used. Near the entrance to the district was “the Coop”, an Italian fruit vendor stand. The bath house posted instructions in both English and Italian. The name of Canal Street was changed to Dante Place in 1909. The impact of changing the name of the street had a large impact on the neighborhood. The rule limiting the women of Canal Street from venturing north into Buffalo proper was lifted. After the women left, the saloons and concert halls began to close. The once notorious dance hall saloon known as the Only Theater became a “normal” tavern and politicians meeting place. Jacob Schoellkopf, a millionaire who made his money from tanning…owner of the Revere Block. Newspaper articles of the day criticized him for the poor conditions in his buildings. Former brothels and hotels for canal workers and travelers became tenements. These three and four story brick buildings housing multiple families in crowded conditions. The tenements were poorly-ventilated, small rooms with little heat, frozen pipes in winter and little sunlight. Cholera and pneumonia were common in the tenements. Many of the immigrants lived in poverty. Rooms rented for $6/month (about $100-130 in current dollars). In 1890, one old hotel called the Revere Block, originally designed to hold 100 guests, had 1,040 residents living in crammed conditions. Reports in other buildings included 18 families crammed into four rooms; 56 people sharing eight bedrooms. Conditions in many of these tenements were disgusting and unsanitary. Social work organizations began working to help deal with the conditions in the district. 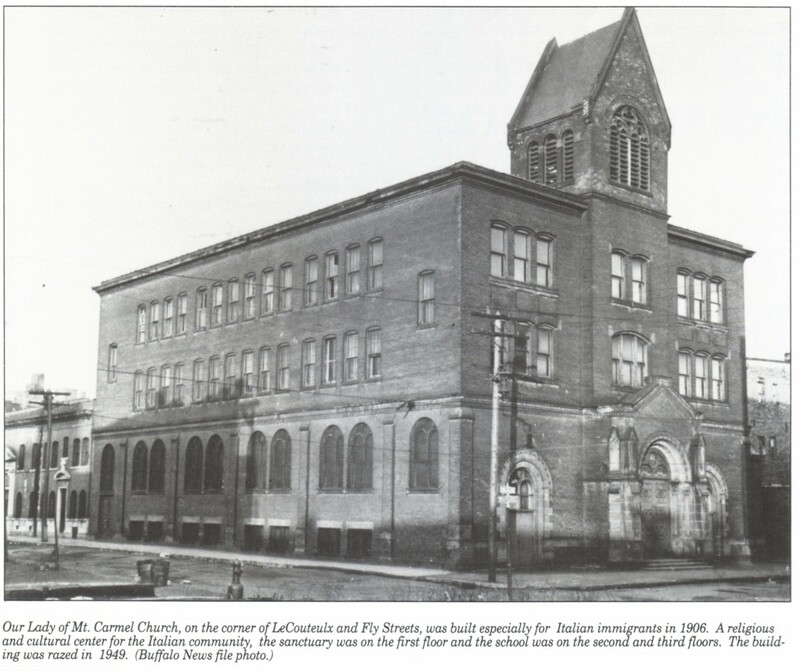 Charity Organization Society and Miss Maria Love began to work with the churches around 1895, working to organize efforts against poverty throughout the City of Buffalo. Seventy-six churches, of 12 denominations, pitched in to help around the city. Each church was responsible for a district, working for the “moral elevation of the people, and for the relief of all the needy and neglected persons of whatever religious faith within the district”. Instead of offering direct relief, many of these societies attempted to address the cycle of poverty. 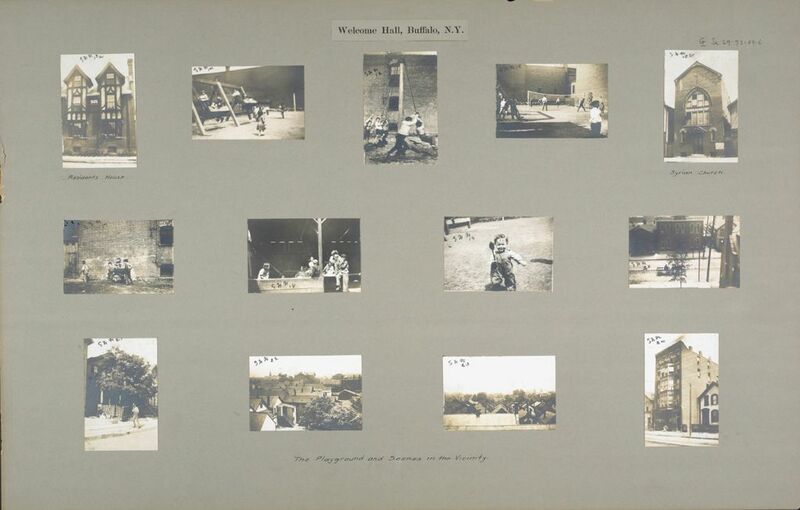 Images from one of the settlement houses in Dante Place. 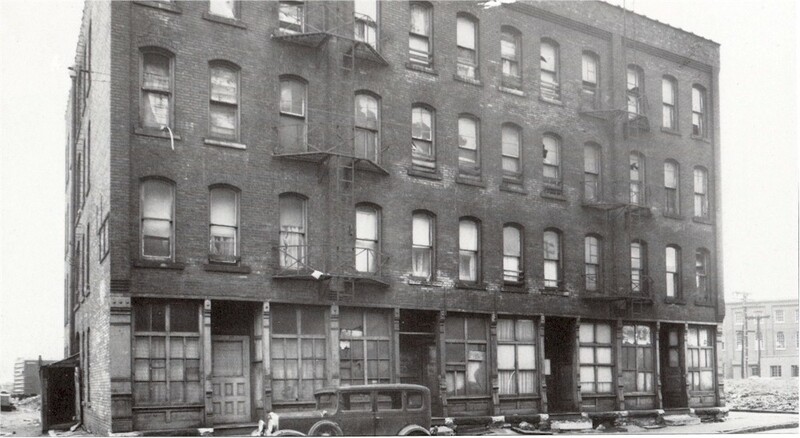 Remington Hall was located at the corner of Erie Street and Canal Street (next to the Revere Block) and was one of the settlement houses located in the canal district. 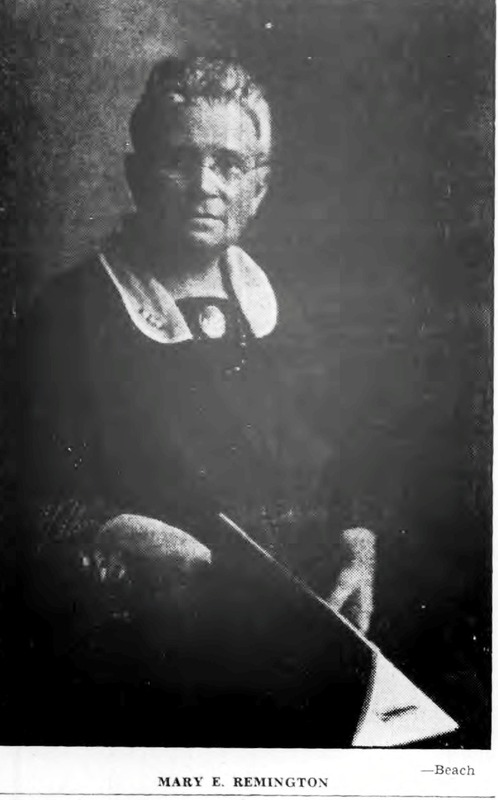 Miss Mary Remington was the head of the settlement house, working with First Presbyterian Church to reform one of the “vilest tenements in Buffalo”. Mary Remington was born in 1859 in Connecticut and began working to help others at a young age. At the time, social service was in its infancy and community centers were not common. In 1894, when Miss Remington came to Buffalo, she noticed that the churches were ignoring the Canal street district, but she saw that the need there was the greatest. Many Buffalonians did not believe that she could make a difference in that neighborhood, but she was determined to try. Remington Hall included a kitchen, sewing classes, a Sunday School, mothers’ meetings, a nursery and kindergarten, vocational education, housekeeping and cleanliness classes and recreational programs. Miss Remington served as landlord, cook, leader of religious services, pianist, teacher and friend to the needy regardless of their race, creed, age or reputation. She was referred to as “mea madre” by many of the Italian immigrants. She wrote letters for the men who could not write, she delivered soup and tea to sick women, bailed neighbors out of jail and helped out her neighborhood in any way she could as part of her daily routine. During the Pan American Exposition in 1901, she took in extra borders and raised $1,000 to do repairs to her building and open a fresh air lodge at the old International Hotel in Fort Erie for poor residents to go to experience a summer change of scenery. She helped more than 100 women who had kept brothels by showing them a different, upstanding way of life. She sustained the Remington Hall primarily by the rents she charged her tenants. She was named among the “Woman’s Who’s Who of America” in 1914. In 1933, Miss Remington said, “If I could live my life over, I would again spend it among the poor”. During the depression, Miss Remington’s health declined and she was forced to move to the country. She still continued to provide for the needy, knitting mittens and sending vegetables from her gardens in to the city. The Settlement House Movement was strong in Buffalo and settlement houses existed across Buffalo. Two of the oldest – Westminster Community House (1893) and Neighborhood House Association (1894) merged to form the Buffalo Federation of Neighborhood Centers (BFNC) in the 1980s and still provide services in the Fruit Belt Neighborhood. While settlement workers tried hard to make conditions better for the residents in poverty stricken areas, many of the early social workers were viewed as outsiders. They were thought to undermine old world culture rather than seeing its positive value. In Dante Place, they misunderstood many of the Italian immigrants, and the Italians misunderstood them. The American values of sobriety, thrift, sociability, industry, cleanliness, patriotism and “properness” were foreign to the southern Italians of the district. Many of the Sicilian men resented the settlement’s intrusions into family life. The district was described as “looking more and more like Little Italy by day, and the old-time pit of vice and iniquity by night”. There were reports of organized crime, but for this area, this was nothing new. Many of the Italians formed their own fraternal organizations, professional societies and cultural clubs. There were so many of these groups that a Federation of Italian-American Societies was established in 1906. 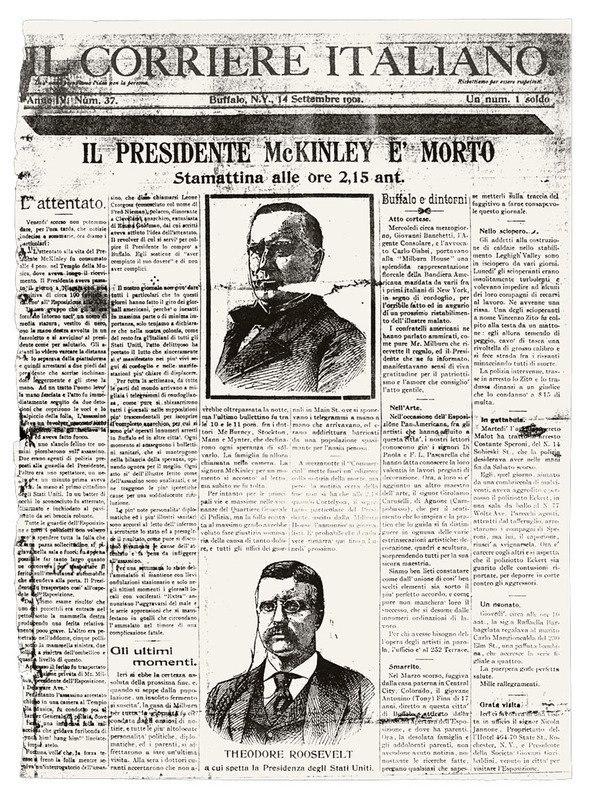 One of the important Italian newspapers in Buffalo was known as Il Corriere Italiano (the Italian Courier). The paper was published from 1898 until the 1950s. The editor of the paper also published a book in 1908 called La Citta di Buffalo, NY (the City of Buffalo, NY) which was written to bring potential immigrants from Italy. Most of Buffalo’s Italians worked as laborers. Many of the Italians worked on construction of the Pan-American Exposition in the northern part of the City of Buffalo in 1901. During the Pan-American Exposition, the Italians were represented by the Venice in America attraction on the Midway of the Exposition. The attraction included mandolin and guitarist players. During the 1920s, New York State began to fill in the Erie Canal. At the time, the abandoned canal waters stood stagnant and polluted. By the 1930s, the area was considered one of Buffalo’s worst slums. Citizens living in the “proper” part of Buffalo continued to cast their eyes down on the waterfront. 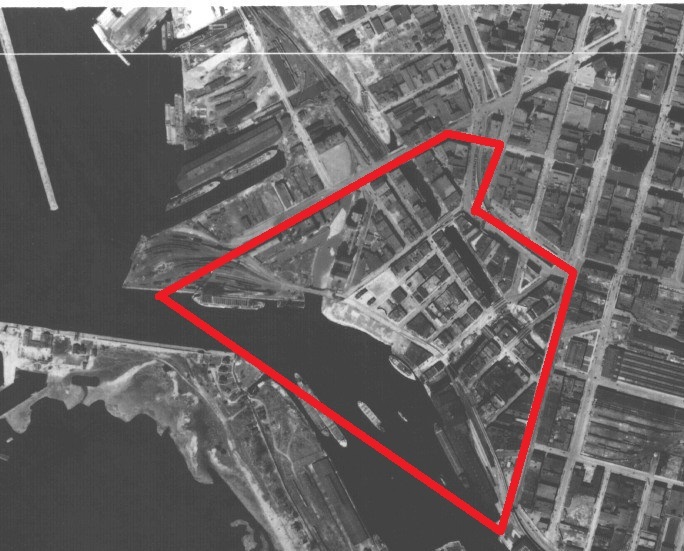 City Planners began a 40-year fight to change the area to create something new on the waterfront, to create something of which the whole city could be proud. Little Italy lingered on for a little longer; however, the neighborhood began to look old and dilapidated. Many of the Italians from Little Italy began to integrate into the rest of the city, as their families began to earn enough to move into houses on the Lower West Side. The paved streets, concrete sidewalks and trees of the Lower West Side was seen as an improvement from the manure filled cobblestones and wooden sidewalks of the Canal District. In 1949, Mount Carmel Church closed, and St. Anthony’s on Court Street replaced it as the main Italian church in Buffalo. The Italians celebrated many of the feast days with parades and large religious festivities. Among these was the Feast of St. Anthony, when people came together for a parade and festivities. The St. Anthony’s Festival on Connecticut Street began in 1976 as a way to bring back the days of the old traditions. The Connecticut Street festival was moved to Hertel Avenue in the 1980s and is the annual Italian Heritage Festival, held every summer and attracting an estimated 600,000 annually. 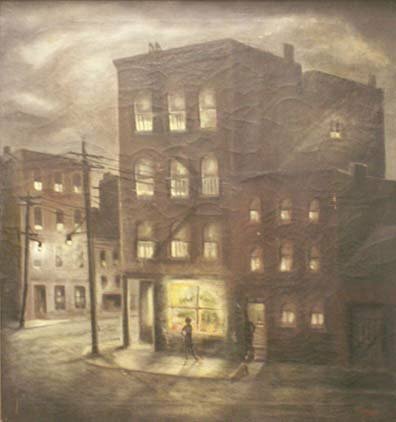 In 1936, one of the residents of a tenement in Dante Place lit a candle and went into the basement, causing a Natural Gas explosion that lifted the entire building off its foundations. Five people died in the blast, bringing national attention to slum areas, which spurred new legislation. Buffalo quickly moved to raze the substandard buildings in Dante Place, and by 1937, over 160 buildings had been demolished. In 1948, only 90 families remained in the area. The Buffalo Courier Express noted in October 1936 that this may have been the first slum clearance rehabilitation project in the United States. In the 13 block area, there had once been 1500 residents and by 1936, there were only 124 remaining. As if overnight, the Terrace once more is coming to life. The massive new hall will be the mainstay, but city planners also want to improve the section with a boulevard in the old canal bed, waterfront parks and relocation, if not removal of the New York Central tracks. Visible proof of these good intentions is construction of the new hall. The Aud opened in October 1940. 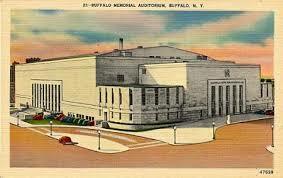 The Aud was host to many events, including circuses, concerts, sports and political events. Over the years, the Aud was home to the Buffalo Bisons of the AHL, the Buffalo Sabres of the NHL, the Buffalo Braves of the NBA, the Buffalo Stallions of the MSL, the Buffalo Bandits of the MILL, the Buffalo Blizzard of the NPSL, and the Buffalo Stampede of the RHI. Additionally, The last of the old saloons was the Peacock Grill, located at 136 Dante Place. In 1950, Libby and Joe Guillo sold the rights to the Peacock Grill building and moved up to Main Street. The era of the Canal District as Little Italy had ended. Stay tuned for Part Three, which discusses the last 60 years of Buffalo’s Canal District. Learn about other streets by checking out the Street Index. Buffalo Evening News 4-15-1950 “Echoes of Revelry Have Faded out and Earth-Movers Clang Away. “Dante Area Streets Get Single Name” Courier Express, November 11, 1960 Buffalo Streets Vol 1. America’s Crossroads: Buffalo’s Canal Street/ Dante Place. Buffalo NY Heritage Press, 1993. Yans-McLaughlin, Virginia. Family and Community: Italian Immigrants in Buffalo, 1880-1930. Maggiotto, Anthony, Sr. LaTerra Promessa: The Promised Land: 200 Years of WNY Italian-American Experiences. Federation of Italian-American Societies of Western New York, 2007. Mary E. Remington Founder of Dante Place Mission. Buffalo Courier Express, August 27, 1933. P 4.